Relatively few people have recently driven car from the “carburetor age” in the last decades; and many drivers have never driven a vintage car at all. This article is for any of you who have not taken an older car onto the roads in the last decade or two — or at all. Drivers of antique cars have the same issues, only multiplied. A 1924 Dodge Brothers car driver might be able to hit 35 mph, but not go any faster, and has brakes that can’t even come close to a 1928 Plymouth, much less a modern car. Cars have become more and more powerful, and able to stop and steer more and more effectively. Unfortunately, they’ve also become laden with distracting devices, too. When these cars were made, it was less common for drivers rely entirely on power of their brakes, though we still had zig-zaggers — those who cross three lanes three times in three seconds, searching for an advantage so they can gain one or two carlengths; they just generally didn’t cut it so close. They couldn’t! (At least, not for long.) Brakes weren’t that reliable. You might stop, and you might not; your bias ply tires (usually on 14 inch wheels) would squeal for an unbearable length of time as the brake cylinders locked up in back… and if you didn’t have front discs, on all four wheels. The usually mistuned and primitive balancing systems would often turn the car at odd angles as you slowed down, unless you took unusually good care of your car. Brakes and tires have both dramatically improved; practically every vehicle now stops quicker and straighter than the best classics. There is no issue around control under full acceleration, as the Leaning Tower of Power doesn’t propel me forward under massive g-forces. It lets me to keep up with traffic, and most of the time I accelerated using the 1/3-pedal rule, which causes the TorqueFlite to downshift or to avoid upshifting, depending on the situation. Things can be tougher when it is over 90°F outside. I need to shut off the air conditioner and give the antifreeze a chance to cool down a bit now and then, and slow down now and then, despite a radiator in excellent shape. These days, we take a lot for granted. Cars run just fine at idle with the air condtioner on; stalling is grounds for a recall. Alternators charge at idle now; but there is one night-time parade where I have to keep the headlights off, or I’ll run out of battery. We did not have decent shoulder belts until 1974 (in 1973, most cars had the separate lap and shoulder belts, and the shoulder belts did not slacken to let the driver lean forward), and rarely had shoulder belts for the rear passengers; airbags were exceedingly rare, and impact standards from any angle were fairly low, with seats that often failed to protect against whiplash. It’s no wonder that there are fewer fatalities per mile now, with easily used shoulder belts in every position, airbags coming from two angles, and heavier steel beams in the doors and roof. Even the seat belts I have are finicky, and are pulled from the floor and not from shoulder level. There are safety features most modern-car drivers take for granted. Many years ago, the safety engineers did a study of Washington, DC taxi drivers, and found that a third, high-mounted brake light prevented accidents; that light soon became required equipment (you can feel free to question the science). People now expect that. They also expect blindingly bright tail-lights and brake lights; what the government didn’t do, though, is improve headlight standards or require amber turn signals. You can carefully upgrade your bulbs if you have an older car, to match the modern ones; an LED-powered third brake light can make a huge difference. Our car has radial tires. Radials were around in 1974, but it the radial suspension kit that compensated for the tire difference was optional (this may have been an option in later years, not 1974). The big safety problem with modern cars “the loose nut behind the wheel,” not the car. That wasn’t necessarily true in the 1970s! In a 1974 Valiant, there’s not much to distract your attention, other than perhaps the alternator gauge. Few people had portable phones; CB radios were an option, but most people did without them, or just listened in. Talk radio hosts didn’t try to make you angry, fomenting road rage. The average car had no tape deck, just a simple radio with two knobs and some mechanical tuning buttons. There was no navigation system, no trip computer, no cupholder, and no center console to hold food. Distractions were far fewer, and people drove better as a result. Not only that, but you knew that you couldn’t stop on a dime, or indeed, in a straight line, so tailgaters were quickly trained to quit it. Getting back to the point – what is it like to drive one of these cars? You get in, and the bench seat offers little resistance, providing you with a surprising level of support as you sink into it, support that’s matched to your body (you can’t say the same about cars with the taxi or police package). The seating position is upright; the back of the seat does not recline, but the entire bench can, with difficulty, be moved forward or backward. The steering column is also fixed, at just the right height, if you happen to be just the right height. The key goes into the column as with modern cars, teeth up – like your house, and unlike the GM product down the street. Chrysler used two keys then, one for the ignition and doors, the other for the trunk, in case you used valet parking and wanted your trunk to be safe. GM used one for the door and one for the ignition, primarily to drive you crazy (you had to switch keys every single time you got in and started up), but also in case you wanted someone to be able to get into your car but not start it. After shutting off the air conditioner – which would stall the engine if turned on too quickly after startup – you push the pedal quickly to the floor once, let it up, and then turn the key with your foot down just a little on the gas, and it starts up nicely. With the car idling smoothly, you use the stalk-mounted gearshift to go into Reverse, wait a moment for it to engage, then press the gas; the engine revs a bit before you actually start to move, and then it’s smooth sailing. After getting out of the driveway, you can put the air conditioner on, and the engine will be just fine, especially if you don’t stop at a light for a long time; that can bring a rough idle as the old battery fails to provide the needed current, with the old, underperforming original 41-year-old alternator unable to keep up. Newer cars have much more powerful alternators, easily able to charge at idle, as did some cars from that era. The ride is not too floaty on this compact car, and it is a bit busy but not too busy; it is similar in some ways to a 300M or PT Cruiser GT, fairly firm, but with far less ability to turn corners. Cornering does feel pretty good until you start to push, and then you realize that pretty much any current passenger vehicle will outhandle an unmodified slant-six Valiant, despite its well-tuned torsion-bar suspension (this particular vehicle had its front lowered slightly). Push the car and you get an insane degree of body lean. Still, it feels good going around normal turns, on those big, high-profile tires – on little fourteen inch wheels, but not bad for the time, when the muscle cars were only on fifteen inch steel rims. The engine feels pretty capable; the torque helps, this being an old-fashioned, torque-biased engine that gives a quick boost right off the line. Indeed, the slant six is surprisingly responsive at normal speeds, only really failing when extended power is needed (or on the highway, at serious speeds). Even then, you find that, with extra effort, you can keep up with just about any normal driver; most people never go fast enough to tax an old hundred-horsepower slant six pushing a three thousand pound car with a three-speed hydraulically-shifted automatic. The engine has plenty of reserve at the legal 65 mph limit. That is perhaps the greatest surprise – you know that the Valiant is not competitive with a modern car in what used to be its class when it comes to handling and acceleration; the numbers are pretty clear. Most any car can do 0-60 in ten seconds or less, and most can do it in eight or less. People might have two or three hundred horses under the hood; they might drive cars that can reach 60 mph in under six seconds; but they normally go from 0-60 in 20 seconds or more; and they leave traffic lights at a leisurely pace that the Valiant has no problem matching. Cornering is also generally no problem. It amazes me that people will spend tens of thousands of dollars extra to get a car that can corner like a demon, and then spend their time driving it at a pace that would not challenge an old economy car. The one thing people do use is their superior brakes. The windows are much easier to roll up and down than manual windows in newer cars; the triangle windows up front are very convenient and we miss them in modern cars, though they’d probably increase drag too much. The smooth shifting is surprising given the lack of torque management, but the transmission was, after all, designed for even more torque; the instant kickdowns are also interesting given the pure-hydraulic system. The engine is quiet, except under load. We missed the fender vents of older, non-air-conditioned cars, but one can’t have everything. The trunk is also small for a car of this size, sacrificed for the low, long, and sleek look; the Duster had a much bigger trunk. Wipers are effective and short so they don’t wear out often. Parades are fun, and one tends to hear a lot of comments about “I drove one of those,” and “Hey, look, it’s a Dart!” Some, admittedly, question by a car that clearly has four doors and no V8, and isn’t from the 1940s, is in a parade. Overall, classic American cars have a lot of good features, but it’s easy to see why the world moved forward. Driving them is fun; owning them is fun; and they are enjoyable in some ways newer cars are not. Older cars provide a more mechanical experience in many ways, bringing the driver closer to the mechanisms, with no computer mediating the relationship; you have to fiddle with the carburetor, one way or another (especially if you’ve converted back to a manual choke, as many people did “back in the day”). They usually have a very different feel from modern cars, with more torque and (unless you get a muscle car) less horsepower; they give more kick in the pants and less actual acceleration in sprints. 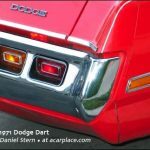 See valiant.org and allpar.com for vintage car tuning and optimization tricks.